The following Design and Use Guide for PC6300, PC6400, PC6600, PC8300, PC8400, and PC8500 Models has been written by Brent Leatherman to help engineers apply information appearing in the Engineering Design Manual for Series 6300, 6400, 8300, 8400 Perma-Columns. I wrote the latter document after conducting a number of tests on Perma-Columns in my laboratory at the University of Wisconsin-Madison. In addition to a summary of UWMadison test results, the Engineering Design Manual contains details on how to calculate design properties for Perma-Columns. The Design and Use Guide reviews these procedures, and contains sample calculations and comparisons that you will not find in the Engineering Design Manual. Perma-Columns are a more environmentally-friendly alternative to preservative-treated wood, and quite likely, a more durable alternative. Using the information contained in this document and in the Engineering Design Manual, an engineer can better ensure the structural integrity and safety of buildings incorporating Perma-Columns. • A reinforced precast concrete base column component designed according to the Building Code Requirements for Structural Concrete (ACI 318-11) by The American Concrete Institute (ACI). • A structural reinforcing bracket assembly designed according to the Steel Construction Manual (14th Edition) by The American Institute of Steel Construction (AISC). • A laminated or solid sawn wood column component designed according to the 2012 Edition of The National Design Specification for Wood Construction (NDS) by the American Wood Council (AWC). Structural analysis was performed using both the load and resistance factor (LRFD) and the allowable stress/strength design (ASD) methodologies. 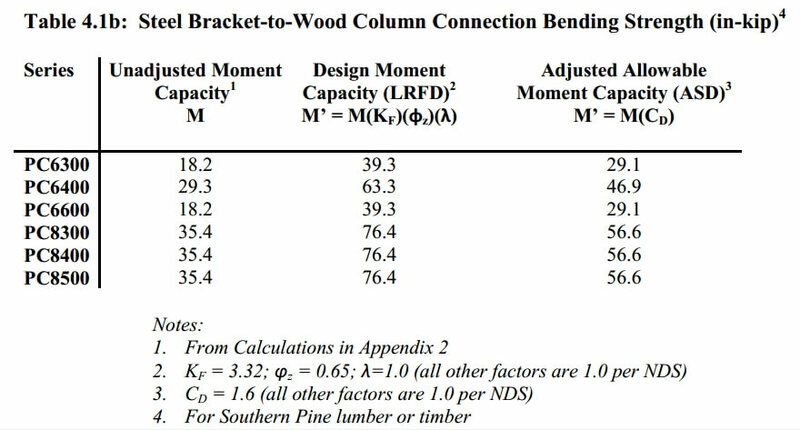 This was done so the laboratory results from the Perma-Column Test Report, which is based on LRFD, could be used, while also expressing the expected column performance in terms of maximum allowable capacity as is customary in the wood industry. This Design and Use Guide will cover properties and design procedures for the reinforced concrete base, the structural reinforcing bracket assembly connection, and the laminated wood columns. The procedure for creating models of the Perma-Column assemblies to simulate the results of laboratory testing is discussed. A Design Chart is presented for the Perma-Column assemblies with varying heights and boundary conditions. 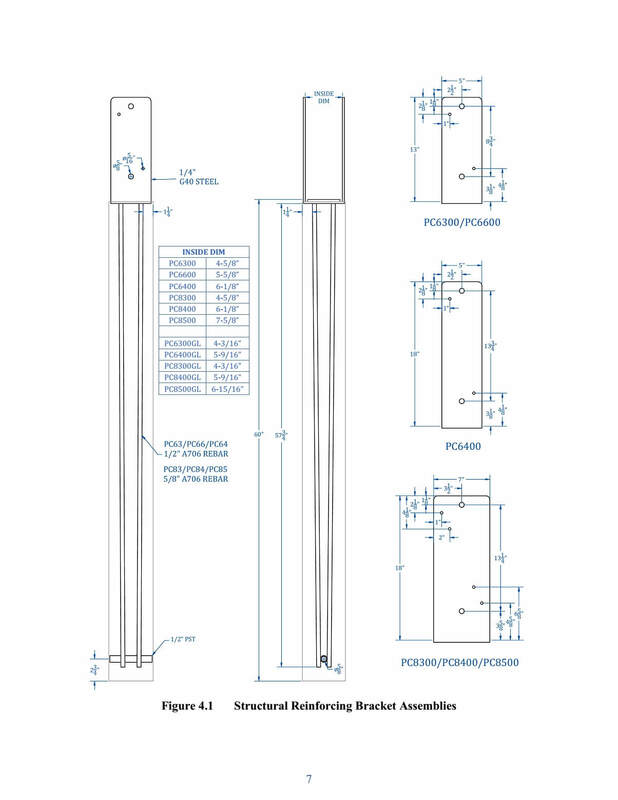 The failure modes and design limitations on each Perma-Column assembly are listed, and an example is given showing a straight forward design approach which can be applied to all Perma-Column assemblies. Finally, wind uplift resistance is calculated for a concrete collar or a compacted fill foundation condition. Dimensions and material properties for the PC6300, PC6400, PC6600, PC8300, PC8400 and PC8500 models are given in Table 2.1. Variable definitions correspond to Figure 1.1 of the Perma-Column Test Report. The PC6600 and PC8500 were not included in the laboratory testing. 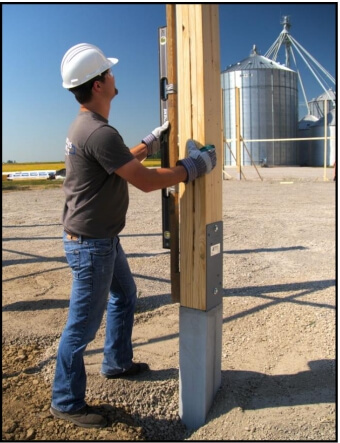 The PC6600 is intended for new or replacement solid-sawn 6x6 posts, and the PC8500 is to be used with a 5-ply 2x8 laminated wood column or 8x8 wood post. 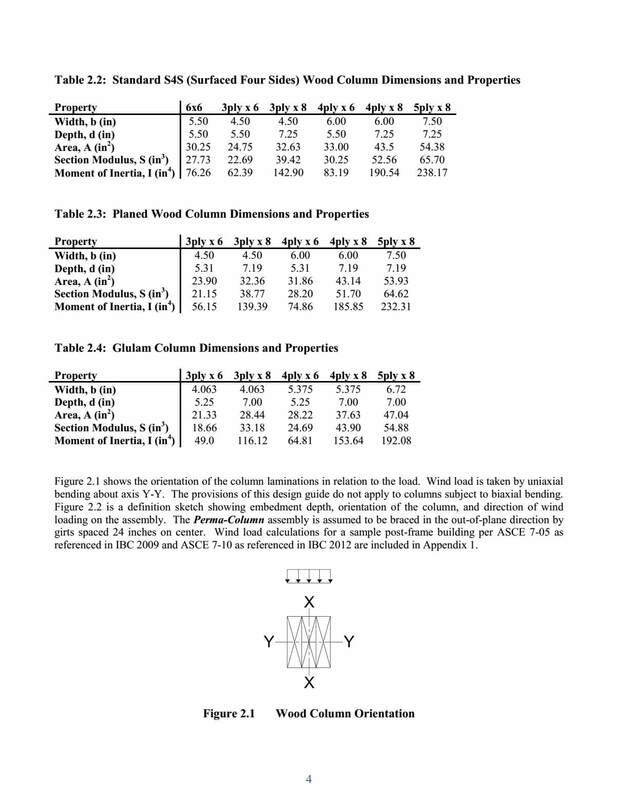 Tables 2.2 through 2.4 give dimensions and section properties for several different wood column sizes and types that are included in this report: 6x6 solid-sawn; and 3-ply 2x6, 4-ply 2x6, 3-ply 2x8, 4-ply 2x8 and 5-ply 2x8 mechanically laminated and glued laminated (glulam) wood columns. The mechanically laminated group consists of #1 Southern Yellow Pine (SYP) and of #2 and better Spruce Pine Fir (SPF) lumber using standard dressed sizes (surfaced four sides (S4S)); as well as #1 SYP laminations which have been further planed for better visual appearance. The glulam group consists of SYP laminations which have been planed down as part of their standard fabrication process. Perma-Column models for use with glulam columns are identified with a “GL” at the end of the name. These models have a reduced inside dimension so as to fit tightly with the glulam products. The reinforced concrete component is manufactured with 10,000 psi (nominal) precast concrete and four (4) 60,000 psi vertical reinforcing bars. Number 4 bars are used for the PC6300, PC6400, and PC6600, while number 5 bars are used for the PC8300, PC8400, and PC8500 models. The required concrete cover for reinforcing bars in precast concrete is less than cast-in-place concrete because of better placement accuracy during the manufacturing process. Each of the Perma-Column models meet the minimum concrete cover of 1.25 inches required for precast concrete components that are exposed to earth or weather. The high concrete strength and quality is achieved by adding superplasticizer, which increases strength by allowing a low water-to-cement ratio. Fiber reinforcers are added to reduce shrinkage, increase impact resistance, and increase flexural strength. Other admixtures are included in the concrete mix to increase freeze/thaw resistance, protect the steel reinforcement from rusting, increase flexural and compressive strength, and optimize the hydration process. Figure 4.1 shows dimensions for the different structural reinforcing bracket assemblies that are used with the Perma-Column assemblies. The brackets consist of ¼” structural grade 40 steel (Fy = 40 ksi) with 5/8” diameter holes for the bolts, and 5/16” diameter holes for screws. The bracket connection utilizes ½” diameter A325 bolts in double shear with hex nuts torqued to 110 ft-lbs, and ¼”x3” strong drive screws (SDS) by Simpson Strong-Tie (or equivalent) in single shear. Typically, one screw is installed from each side of the bracket at each bolt, except the PC8300, PC8400 and PC8500 have two screws on each side at each bolt. These screws help prevent stress concentrations around the bolt which would cause splitting of the wood members. The wood column bears directly on a ¼” steel seat plate which helps to transfer axial loads into the concrete base. Four A706 weldable reinforcing bars are inserted in holes in the bottom of the bracket and fillet welded, connecting the bracket to the concrete base. The internal forces of shear and bending moment are transferred from the wood column through the steel bracket into the concrete base. Section 4.2 of the Perma-Column Test Report states that as long as the reinforced concrete portion of the assembly is shown to adequately handle shear forces, there is no need to check the shear capacity of the bracket. This is because all shear related failures observed in laboratory testing occurred in the reinforced concrete base and not in the bracket. However, it is important to check the bending moment capacity and rotational stiffness of the bracket. This joint has significant bending moment capacity and does not need to be modeled as a pin. The laboratory testing for this joint was completed using a 1/3 point loading arrangement that isolates the shear strength and bending strength of the joint as described in Appendix B of the Perma-Column Test Report. It is important to note that testing was performed for strong axis bending only. The bending strength of both the concrete-to-steel bracket and the steel bracket-to-wood column connections must be evaluated in order to determine the overall moment capacity of the joint. The reinforcing bars transfer shear and moment between the concrete base and the steel bracket. 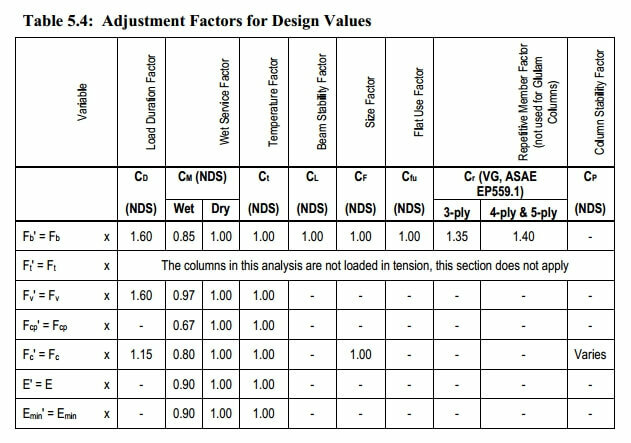 The failure modes observed in the laboratory testing are 1) concrete crushing and 2) tension steel fracture (see Figure B.5 and B.6 in the Perma-Column Test Report). Nomenclature for this section is taken from AISC. The nominal bending strength, Mn, of the concrete-to-steel bracket connection is given in Table 4.1a, and is defined in the following expression: Mn = M0.03, where M0.03 is the bending moment corresponding to 0.03 radians rotation in Table B.2 of the Perma-Column Test Report. 0.03 radians was chosen as a limit state as recommended in Section 4.1 of the Perma-Column Test Report. For Strength Design (LRFD), the design flexural strength of the concrete-to-steel bracket connection is expressed as: φbMn, where φb = 0.90; and for Allowable Stress Design (ASD), the allowable flexural strength is expressed as: Mn/Ωb, where Ωb = 1.67. The bolts and screws transfer shear and moment between the steel bracket and wood column. The shear strength of the fasteners themselves, not the steel bracket, control the bending strength of this joint. The bolt and screw design, as well as the nomenclature for moment capacity using LRFD and ASD, is done according to the 2012 NDS. Forces from the moment couple are applied to the upper and lower fastener groups and are distributed to the bolt and screws according to their respective stiffness as described in Section 6.1 of the Perma-Column Test Report. The unadjusted moment capacity, M, of the steel bracket-to-wood column connection is given in Table 4.1b and is determined by calculation (See Appendix 2 for calculations). The bolt yield strength was taken as the proof stress for an A325 bolt. For Strength Design (LRFD), the design moment capacity of the steel bracket-towood column connection is expressed as: M’ = M(KF)(φz)(λ), where KF = 3.32, φz = 0.65 and λ = 1.0; and for Allowable Stress Design (ASD), the adjusted allowable moment capacity is expressed as: as: M’ = M(CD), where CD = 1.6 for wind loading. Comparing the corresponding columns of Tables 4.1a and 4.1b, it is clear that the steel bracket-to-wood column connection controls the bending strength of the joint in most cases. The design flexural strength (LRFD) of the PC6400 concrete-to-steel bracket connection is 53.1 in-kip from Table 4.1a, and the design moment capacity (LRFD) is 63.3 in-kip from Table 4.1b. 53.1 < 63.3 so the Table 4.1a value controls. For all other cases, the bending strength given in Table 4.1b for the steel-to-wood connection controls. The rotational stiffness of the steel bracket connection depends upon both concrete-to-steel, and steel-to-wood movement. 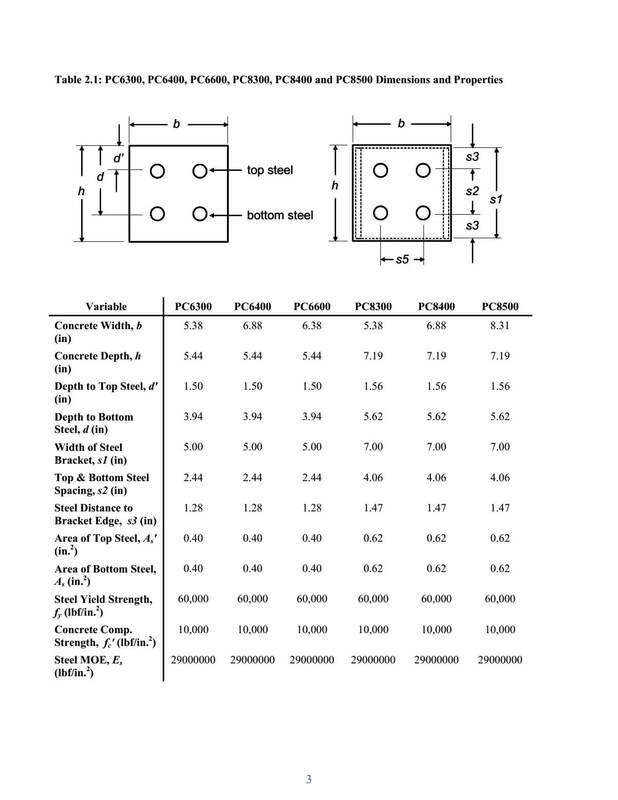 Table B.2 and Figure B.4 in the Perma-Column Test Report (also in Appendix 3 of this document) show joint rotation versus bending moment data for the steel bracket-to-concrete connection. As indicated in Section 4.1, the steel bracket-to-wood connection controls the allowable flexural strength of the bracket for all cases except the PC6400. 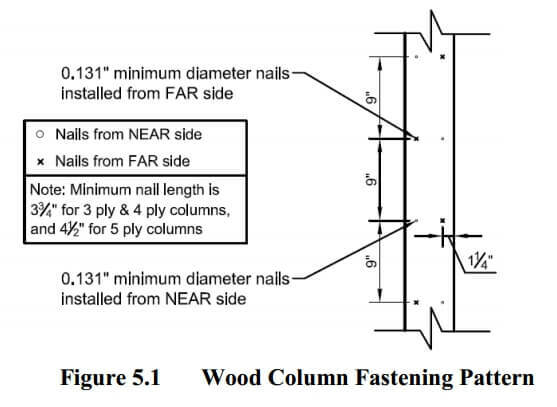 From Figure B.4 of the Perma-Column Test Report, the allowable flexural strength of the steel-to-wood column connection occurs approximately at 0.01 radians rotation. Therefore, the rotation, θ, of 0.01 radians, and the corresponding bending moments, M, should be used to establish the rotational stiffness of each bracket defined as M/θ. This point on the joint rotation versus bending moment curve (See Appendix 3) best represents the stiffness the bracket will have when loaded. Table 4.2 shows the calculated stiffness values for the concrete-to-steel and the steel-to-wood joints. These stiffness values are needed in order to create a model per Section 6 of this guide. 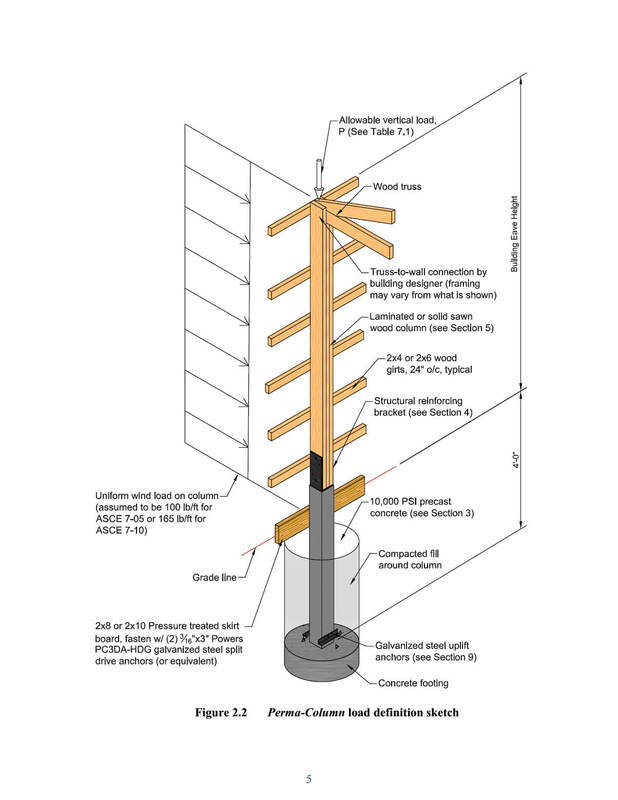 The stiffness of the steel-to-wood connection is controlled by the slip modulus for the bolts and screws, and is discussed in Section 6 of the Perma-Column Test Report. The slip modulus should be assigned to the fastener group by taking the sum of the values of the individual fasteners in the group. The slip modulus for the ½” bolt in double shear is 85.5 kips per inch, and for each screw is 28.7 kips per inch. The actual distance between the centroids of the fastener groups can be calculated based upon the stiffness and location of each fastener. This value is given in Table 4.2 for each model and is also included on a sketch in Appendix 3. The moment capacity and rotational stiffness of the steel bracket-to-wood joint is enhanced by friction produced by the tendency of the bracket to pinch together as the bending moment increases. No increases were taken in the Perma-Column Test Report for this phenomenon, but it remains as an additional safety factor against steel-towood connection failure. The wood portion of the Perma-Column assembly is designed using the ASD methodology in accordance with the NDS by AWC as discussed in Section 1 of this guide. The wood design values used in this work are shown in Tables 5.1 through 5.3. Southern Pine design values for mechanically laminated columns are taken from the Southern Pine Inspection Bureau (SPIB) Supplement Number 13 which went into effect June 1, 2013. Design procedures were taken from ASAE EP559.1 Design Requirements and Bending Properties for MechanicallyLaminated Wood Assemblies. Design procedures for glulams were taken from the NDS by AWC. Table 5.4 contains adjustment factors to be applied to the wood design values. No wet service reductions have been used for the Perma-Column assemblies since the wood portion is not in contact with the soil or concrete and is assumed to be used within an enclosed building. The wet service reduction factor is shown in Table 5.4 and it is different for each variable. There are no splices in the wood laminations. Axial load is assumed to be transferred by direct bearing on the seat plate and not through bolts or screws. Buckling length for bending about the strong axis is one foot less than the overall column height because the concrete portion extends one foot above grade. Structural analyses were performed using #1 Southern Yellow Pine (SYP) and #2 and better Spruce Pine Fir (SPF) with planed or standard dressed mechanically laminated lumber. The column laminations for the mechanically laminated columns are assumed to be fastened together with two rows of 0.131” minimum diameter nail or wire fasteners using a 9 inch maximum on center spacing and a nailing pattern with near side and far side installation as shown in Figure 5.1. The minimum fastener length is 3.75” for 3 ply and 4 ply columns, and 4.5” for 5 ply columns. Fastener calculations are given in Appendix 2. Alternatively, it is acceptable for the fasteners to penetrate all the way, or nearly all the way, through the column width. Construction structural adhesive may be applied between the plies on each face, but it was not included in the calculations for the mechanically laminated columns. The mechanical fasteners alone are adequate to resist the Minimum Required Interlayer Shear as listed in Table 4 of ASAE EP559.1. Glulam columns are also included in Table 7.1 in Section 7. Glulam columns have no mechanical fasteners and they depend heavily on the glue applied between the laminations. Figure 6.1 shows an example of the structural analogs that were used to check each Perma-Column assembly. The structural analysis was performed using Visual Analysis by Integrated Engineering Software. The structural analog was created with element stiffness values that closely simulate laboratory test results. These structural analogs can be used to predict Perma-Column assembly behavior under many different load conditions. Three post models were analyzed for each height to simulate different boundary conditions at the eave. • Eave Condition I assumes a very rigid diaphragm which allows no horizontal movement at the eave. The deflection limit for this condition is L/120 for walls without brittle finishes and is controlled by curvature of the post. • Eave Condition II allows horizontal movement corresponding to the eave height divided by 240 (L/240). The deflection limit for this condition is L/240 for walls with brittle finishes and is controlled by sidesway at the eave or, on taller columns, at the location of additional curvature of the column. • Eave Condition III allows horizontal movement corresponding to the eave height divided by 120 (L/120). The deflection limit for this condition is L/120 for walls without brittle finishes and is controlled by sidesway at the eave or, on taller columns, at the location of additional curvature of the column. Column deflection should be checked using service loads and deflection limits are taken from IBC 2012 Table 1604.3 for exterior walls with brittle or flexible finishes, L/240 and L/120, respectively. These eave displacements were evaluated using ASD load combinations, mainly dead plus wind (D+W), and the larger of sidesway or curvature was taken as the controlling value. Horizontal movement is created in the models for these two eave conditions by using a spring support in place of a roller support with the spring constant adjusted to allow the appropriate amount of deflection. The concrete element for each Perma-Column model was created using a concrete modulus of elasticity, Ec, of 5.7 million psi, and an effective moment of inertia, Ie, as given in Appendix 3 (see also Table 5.2.1 in the PermaColumn Test Report). Ie for the PC6600 was matched with Ie for PC6400 for modeling purposes. Similarly, Ie for the PC8500 was matched with I e for PC8400. Bending, axial and shear strength properties of the reinforced concrete are summarized in Appendix 3 of this document. For a detailed discussion, see Section 3 of the PermaColumn Test Report. Element “PC” of the analogs shown in Figure 6.1 represents the reinforced concrete base. Element “SC” in the analog represents the concrete-to-steel bracket connection. The purpose of this element is to model the bending flexibility of the steel bracket where it attaches to the concrete. This element was assigned a modulus of elasticity, Es, of 29 million psi, an effective length, Le, of 2.5 inches, and an effective moment of inertia, I, equal to S(Le)/Es where S is the rotational stiffness from Table 4.2. Table 6.1 summarizes the moment of inertia used for the steel bracket elements. Element “SW” in the analog is used to model the steel bracket-to-wood column connection. This element extends between the fastener groups and models the rotation between steel and wood. The length varies depending upon the distance between the centroids of the two fastener groups. 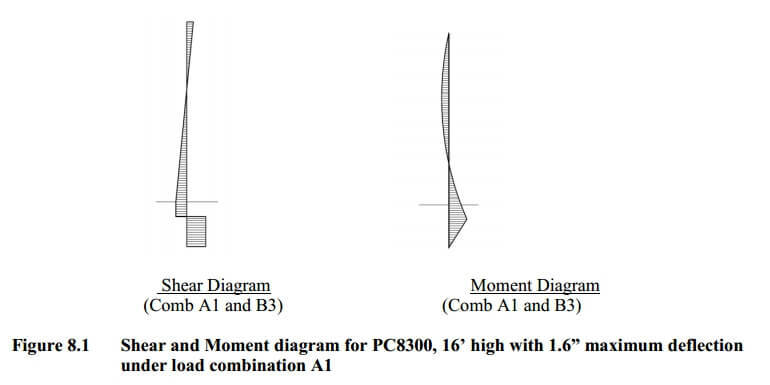 In the structural models, 8 inches was used for PC6300 and PC6600, 13 inches for PC6400, and 11 inches for PC8300, PC8400, and PC8500 (see Figure 4.1). Element “W” in the analog represents the laminated or solid sawn wood column with an E value of 1.6 million psi for # 1 SYP, and 1.4 million psi for #2 and better SPF. The post foundation was modeled assuming a 4’-0” embedment depth. A pin was used at the bottom, and a vertical roller at 1/3 the embedment depth to simulate a non-constrained post foundation. 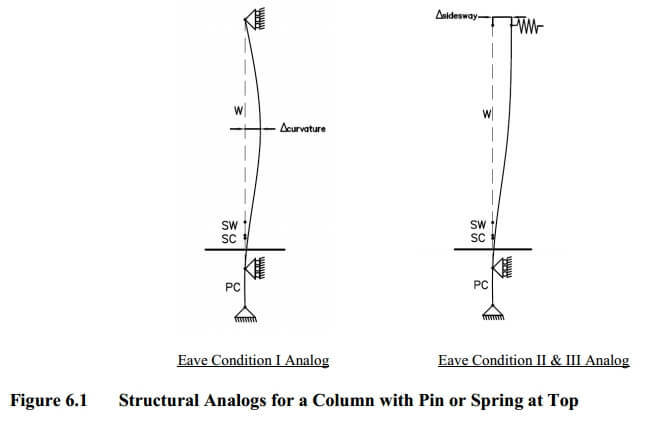 After the structural analog was created and the loading applied, a P-delta analysis was performed for columns with eave conditions II and III to account for increased section forces induced by column deflection. The notes at the bottom of Table 7.1 describe the assumptions and conditions to which these allowable vertical loads apply. The effective buckling length factor, Ke, was taken as 0.8 for columns fixed at the base and pinned at the top (Eave Condition I in Table 7.1). The exact buckling mode case for columns fixed at the base and pinned at the top with a small amount of translation allowed (Eave Conditions II and III in Table 7.1) is not given in classical tables for Ke. Because these columns are part of a diaphragm assembly where the horizontal movement is small compared to the height of the column, Ke is assumed to be 1.0. It is important to note that the structural analogs used to create these charts have a support at the top of the post to simulate resistance to horizontal loads due to diaphragm action. Additional wind bracing or knee braces may be needed in the building design if no diaphragm resistance is present. This is important to remember when using the PC6600 as a replacement post as well. The overall building design should be evaluated to verify that the replacement post is adequate. The main controlling factors in the calculations behind this chart are the imposed deflection limits, and the strength of the wood portion of the column. 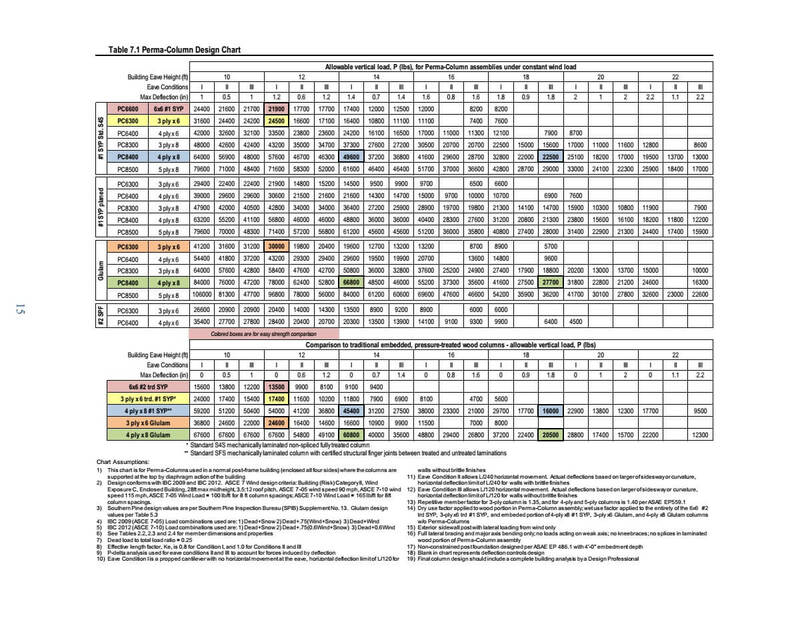 A 6x6 #2 pressure-treated column, a 3 ply 2x6 #1 SYP pressure-treated non-spliced column, and a 4 ply 2x8 #1 SYP column with structural finger joints using the same wind load and boundary conditions are included in Table 7.1 for comparison purposes. These comparison columns are designed as traditional embedded post-frame foundations with treated wood in the ground. It is important to note that the 4 ply 2x8 embedded post has treated laminations in the ground and non-treated above grade. The joint between these laminations is a certified structural finger joint as defined in ASAE EP 559.1. The PC6300 and PC8400 perform significantly better than their 3 ply 2x6 and 4 ply 2x8 counterparts mainly because they have no wet service reduction, and the maximum bending moment is resisted by the concrete component below grade. In some circumstances, the calculated loads may exceed the capacity of a single Perma-Column. A typical example of this is on either side of large door openings. 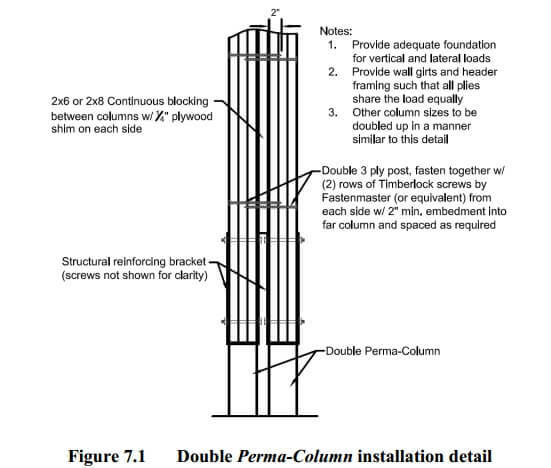 Figure 7.1 shows an installation detail for a double Perma-Column. The uniform wind load and the allowable vertical load can both be doubled for Perma-Columns installed as per this detail, if header framing and wall girts are provided to allow both columns to share the load equally. In addition, the footings on either side of large door openings need to be sized appropriately for the increased vertical and lateral loads they will carry. This design example is for a PC8300 with a 3 ply 2x8 #1 Southern Pine planed, mechanically laminated wood column. The column is 16’ high and the eave is allowed to deflect horizontally 1.6 inches (L/120). The vertical load is 4.5 kips dead load and 13.5 kips snow load. The horizontal loading is 100 plf due to wind loading calculated per ASCE 7-05. All assumptions listed in the chart apply to this example, as does the structural analog with a spring shown in Figure 6.1. This is a summary of the design process; the detailed calculations are available in Appendix 4 of this document. 8.2.7.1 The maximum factored bending moment and axial forces in the concrete column element are listed below and are well within the envelope of the design bending and axial strength interaction diagram for the PC8300 shown in Appendix 3. 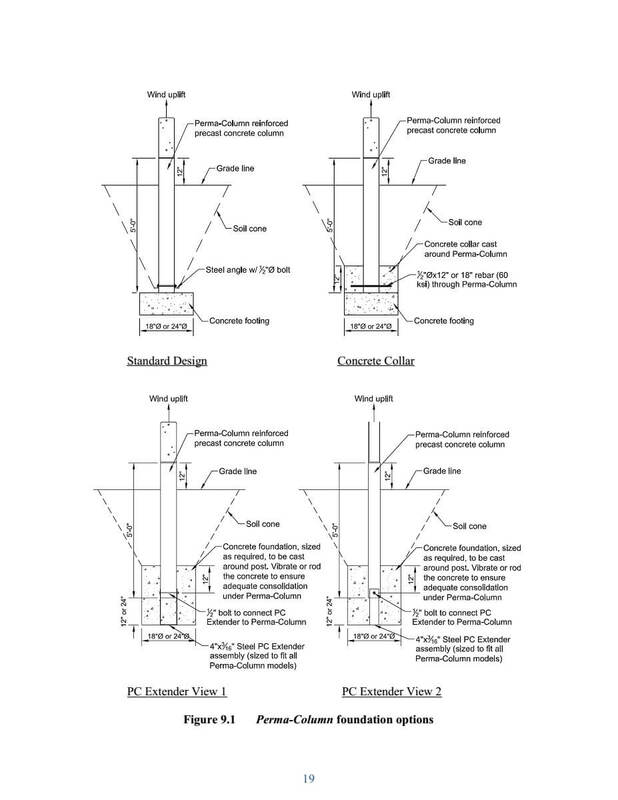 Figure 9.1 shows three foundation conditions that may be used with a Perma-Column: the standard design, concrete collar or PC Extender. The wind uplift resistance can be evaluated for each foundation condition using the procedure described in ASAE EP486.1 Shallow Post Foundation Design. The uplift calculations in this section follow the ASD equations of EP486.1, and therefore should be compared with net uplift loads from ASD load combinations in the International Building Code (IBC) to determine adequacy for a particular situation. Upward movement of a Perma-Column post foundation cannot occur without displacing a cone of soil as defined below. Both of the equations above from EP486.1 have been adjusted to include 25% of the self-weight of the 5 foot tall concrete Perma-Column. 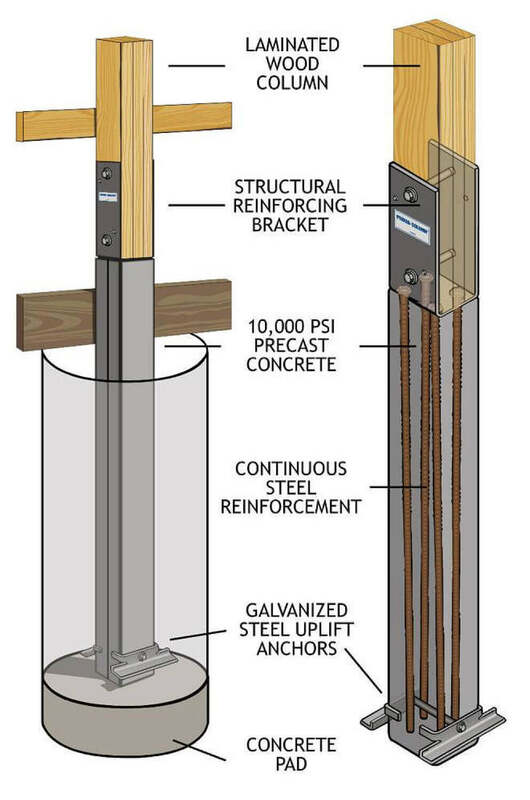 The standard foundation installation as shown in Figure 9.1 has a concrete footing to support the PermaColumn for gravity loads and two 50 ksi yield strength galvanized steel angles that provide uplift resistance. The concrete collar option has a concrete footing for gravity loads, and a separate concrete collar for uplift resistance, as well as increased moment resistance for the embedded column. A ½” diameter reinforcing bar is used as a positive attachment to engage the collar. The PC Extender is a steel assembly bolted to the bottom of the Perma-Column. Some of the benefits of this foundation option include deeper embedment depths, a monolithically poured concrete footing and collar, and slightly higher uplift resistance values because the footing weight can be included. The Perma-Column assembly is designed to be the main structural column in a post-frame building and can be used as an alternative to embedded wood posts. Self Compacting Concrete (SCC) technology makes it possible to manufacture a high quality pre-cast concrete product with a low water-to-cement ratio. The 10,000 psi (nominal) compressive strength protects the reinforcing bars by limiting chips and cracks during handling; reduces the effect of freeze-thaw cycles; and provides a smooth, attractive finish. The structural reinforcing bracket assembly can be designed as a moment connection that is capable of resisting loads for most post-frame building applications, and it allows for the use of non-treated wood by keeping the laminations above grade. The wood portion of the Perma-Column assemblies can be any grade or species of lumber, and can be used with different types of wood shapes. This guide contains #1 Southern Pine and #2 and better Spruce-Pine-Fir lumber using selected sizes of solid sawn, mechanically laminated and glulam shapes. According to data in Table 7.1, The Perma-Column assembly will enhance the structural performance of the wood counterpart it replaces for decades. Each Perma-Column component can be modeled using a structural analog with properties corresponding to the results of the laboratory testing, and can be used to simulate the Perma-Column performance in post-frame buildings of various spans and heights. This guide contains the necessary tools and assumptions needed to create a structural model. The calculations used to produce the design chart indicate that the Perma-Column assemblies are limited primarily by overall deflection, and by the strength of the laminated wood members. There are several foundation detail options including concrete collars, steel uplift angles, and foundation extenders that can be used with a Perma-Column to achieve adequate resistance for lateral, gravity and uplift loads for most applications. The Perma-Column assemblies perform significantly better than standard mechanically laminated wood columns under the same boundary conditions primarily because no wet service reduction is required for the concrete component, and the maximum bending moment is resisted by the concrete portion below grade. The Perma-Column is a permanent foundation solution for the post-frame building market.